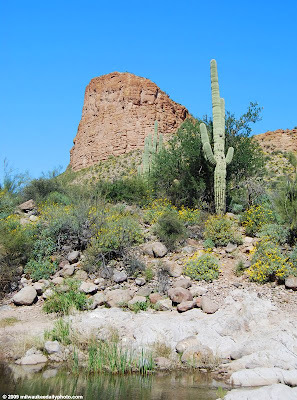 Today we took the Apache Trail from the east side of Phoenix through the Superstition Mountains and the Tonto National Forest. The sights were absolutely wonderful, and the weather was perfect. This photo was taken in Tortilla Flat, population 6. Headed home tomorrow... back to cooler weather! Very pretty — looks almost like it was deliberately landscaped! Took us by surprise to plan a virtual visit to Milwaukee and land in Phoenix. Too funny! Great visit with your stunning photos!